campervan rental: Sneak Peek: Top Gear's "Build a Motorhome Challenge"
Sneak Peek: Top Gear's "Build a Motorhome Challenge"
The boys from Britain's Top Gear--Jeremy, May and Hammond--are at it again. Season 15 of the show debuted on June 27th and it looks to be a real treat. 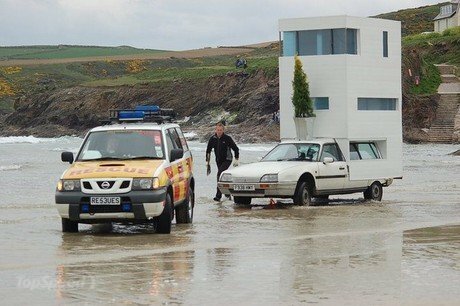 Top Gear has often featured motorhome stunts and races in the past, but it seems like they're determined to top themselves this time. And from the photos and videos we've seen of what's coming up we'd say they succeeded. The new season features the three hosts participating in their "Build a Motorhome Challenge." The result? Well, let's just say that while the "motorhomes" are imaginative they're not exactly pretty. Jeremy has placed a towering bachelor pad atop a Citroen CX, while May has propped a tent on a Lotus. As for Hamster, he's fashioned himself a country cottage complete with (faux?) brick on the back of a Range Rover. Don't have the knack to build your own motorhome? Get a great deal on a motorhome rental at CheapMotorhomes.co.uk. Labels: Top Gear's "Build a Motorhome Challenge"